The STICK3 DMX Controller is the most powerful controller that we sell. One of the greatest features of this controller is the ability to control your LED lights over a wireless network using applications on your smart phone or tablet, or by using a network connection to make changes to your lighting scenes from a network PC with ESA Pro Software. 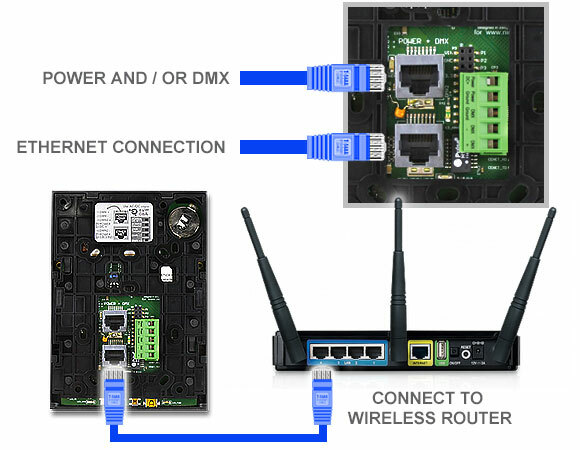 Follow the tutorial below to see how to use the Ethernet connection on your STICK3 DMX Controller. In order to operate your STICK3 Controller over a network or from a Smart Phone/Tablet you must first be sure that you have a wireless router. With power OFF on your STICK3 insert an RJ45 Network cable from an available output port on your wireless router to the bottom RJ45 port of your STICK3 Controller. Once this is done you can apply power to your STICK3 using the 6VDC Stand Alone transformer or by using the mini USB cord. Note: NEVER POWER STICK3 USING BOTH POWER SOURCES SIMULTANEOUSLY. Once you have installed your network cables and turned power on to your STICK3 you can now assign an IP Address to your STICK3 controller for network and smart phone use. Access the STICK3 settings by holding the power button. Use the left/right arrows to navigate to the (E)Ethernet settings. Use the rectangular gray boxes below the display screen to access and change the different settings. Be sure that the Ethernet box is selected, you may use the assigned IP address or create one of your own to avoid interference with other network devices. Once you have set the IP Address for your STICK3 Controller you can now control your LED lights using two available applications. The easiest app to use is called 'DMX Lightpad 3' which basically turns your smart phone or tablet into an app that looks identical to your STICK3 control pad. 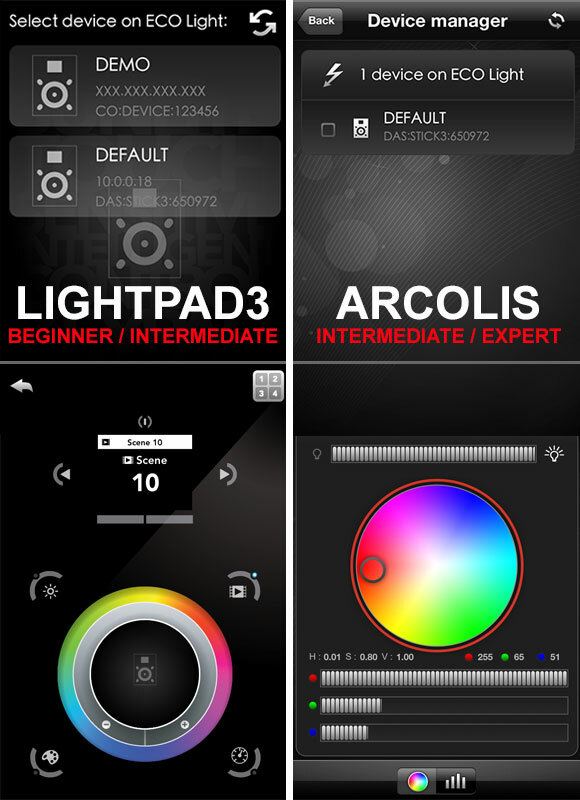 Enabling the user to call scenes, pick a color on the color wheel, adjust speed, brightness, and all other functions from the STICK3 touch pad, recommended for beginner-intermediate users. The other available app is call 'Arcolis'. Arcolis allows you to add lighting fixtures and create both static and dynamic scenes without the need of a computer or ESA software, recommended for , intermediate-advanced users. Most permanent LED installations using a STICK3 DMX Controller mount the controller away from any computer source. Ethernet connection allows the user to make changes to existing lighting scenes without the task of connecting the STICK3 controller to the computer using a USB cord. Upon start up of your ESA Pro lighting software, simply choose the bottom option to control over Ethernet. From here you can access current scenes, make changes, and save your updated scenes to your STICK3 Controller. Note: Scene changes do not reflect in live time, scene must be saved before use. Using current technology such as GoToMyPC any user can access and make changes to their STICK3 Controller from anywhere with an internet connection. Click Here to visit our ESA Pro Software Tutorial.